U.S. Paratrooper History Stein - Bierkrugversand.de - Ihr Spezialist für Bierkrüge, Gläser und Zinnartikel von WW-Team. 11th stein of the series with pewter batch "U.S. Paratrooper" and "parachute" figurine as pewter lid. Limited Edition 5,000 pieces. 11th stein of the series. 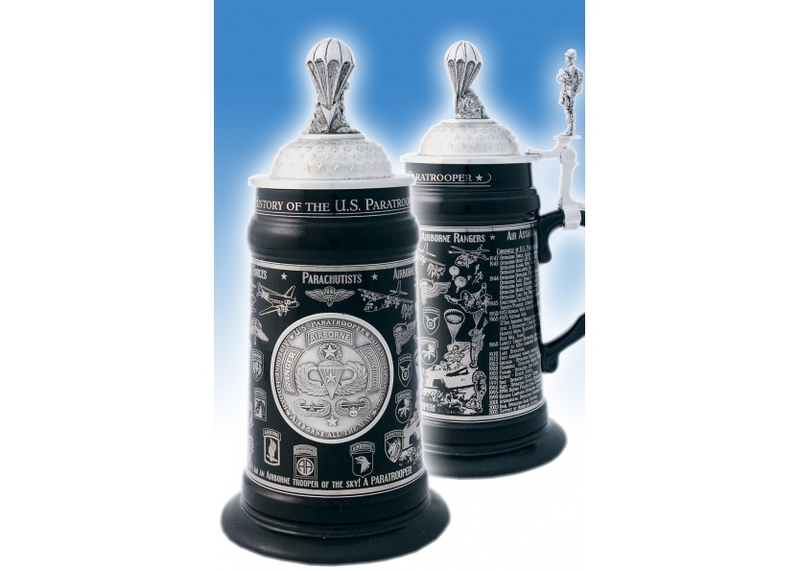 This stein has been crafted to chronicle the history and progression of the U.S. Paratrooper. 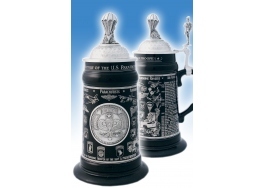 The body of the stein is a smooth, black glazed, high quality stoneware decorated with a platinum wrap around design. Along the top border are the words, THE HISTORY OF THE U.S. PARATROOPER. The left side of the platinum design features several images of paratroopers in action and airplanes flying. It also includes the first half of a timeline detailing the creation and development of the paratrooper beginning with the first balloon artillery observers during the Civil War in 1864. The right side of the platinum design features more images of paratroopers in action, an airplane and a helicopter. The timeline from the left side continues on the right and concludes with the support of Hurricane Katrina relief in 2005. A pewter medallion featuring a Master Combat Parachutist emblem with one service star surrounded by three banners stating: RANGER, AIRBORNE, and SPECIAL FORCE, is fixed at the center of the wrap-around decoration. Just inside the border of the medallion it states, U.S. Paratrooper Silver Wings Upon My Chest Airborne All The Way Airborne - Hooah. Framing the medallion on the body of the stein are several emblems for paratrooper units and along the bottom are the words, I am an Airborne Trooper of the sky! A Paratrooper! Rows of raised stars decorate the ornamental pewter lid and fixed to the top is an intricately detailed pewter figurine of a parachute floating towards the ground. A fully outfitted parachutist pewter figurine serves as the thumblift for this noble stein. Limited edition of 5,000 individually numbered pieces.